On 30 January 2019 Sindh home department issued a report claiming to have resolved 86% of the cases related to enforced disappearances and missing people. Requested by the European Union in face of the prospect of renewal of the CSP Plus status for Pakistan, the report further states 23 families of missing people have been financially compensated. In spite of the report, over 50 families came to the Sindh High Court (SHC) in search of missing relatives. The Sindh home department claimed on Wednesday [30 January 2019] to have resolved 86% of the cases related to forced disappearances and missing persons. The claims came even as the families of over 50 missing persons appeared before the Sindh High Court (SHC), seeking information on the whereabouts of their loved ones, who they claimed had been missing for years. The Sindh home department’s report, which was compiled on the directives of the federal interior ministry, is part of the conditions set forth by the European Union as it considers renewing the GSP Plus status for Pakistan. The federal government had subsequently ordered the provinces to formulate their individual reports. According to the report, as many 3,758 persons were reported to have gone missing in Sindh over the last five years, of whom 3,238 were successfully traced or their cases disposed of. Of the remaining 520 cases, 156 are pending before the Commission for Enforced Disappearances, while 364 cases are pending in the Sindh High Court (SHC). The report also claimed that the families of 23 missing persons had been given compensation of Rs500,000 each. The Sindh High Court (SHC) on Wednesday [30 January 2019] expressed annoyance at the poor performance of Sindh Police and other law enforcement agencies (LEAs) regarding the recovery of more than 50 missing persons and sought reports from the police chiefs of the four provinces and the interior ministry. A two-member bench of the SHC, headed by Justice Naimtullah Phulputo, heard the petitions filed by the families of more than 50 missing persons. The mother of a missing man, Adil, stated before the court: “My son is missing since four years. Prime Minister Imran Khan had claimed that he would recover all missing men, but now where is the change?” The brother of another missing citizen, Faheemuddin, told the court that Saqib, who went missing along with Faheem, had been recovered, but there was still no trace of his brother. He said that police officials had claimed that families of missing person did not cooperate with them, but despite the formation of a number of joint investigation teams (JITs), there was no clue of the missing persons. The bench sought a travel history of the missing citizens and directed the Sindh IGP to investigate the matter personally. It also sought a report from Sindh Police, Rangers, interior ministry and other respondents by March 6. 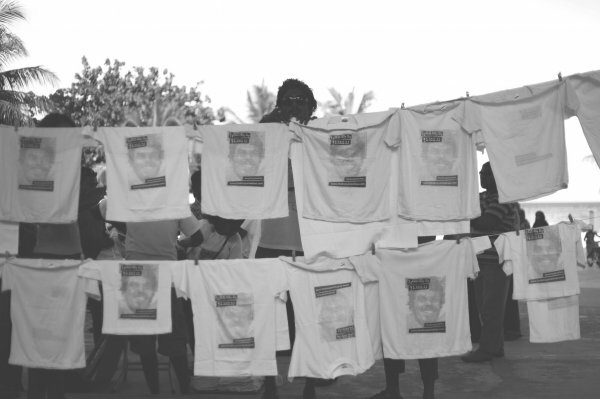 Depicting Ahmed Rilwan Abdulla (@moyameehaa) a Maldivian Journalist has been missing since 8 August 2014.